At CPR Management Services, our success is based on establishing long-term relationships with clientele. In a prudent and confidential manner, we effectively manage insurance claims to an expeditious and favorable conclusion. We professionally investigate and adjust claims, providing timely reporting at a reasonable cost. We provide a strong open line of communication to the assured, claimant, broker and underwriters. CPR Management Services handles Jones Act Seaman claims, tug & barge, marine liabilities, yacht, charter & passenger vessel liabilities, salvage, commercial general liability, discrimination claims, logging claims, cargo, veterinarian and risk analysis. In addition, CPR has been a member of maritime audits of both corporate claims offices and independent adjusting firms. Scott Robinson, president and owner of CPR Management Services, has been in the insurance industry since 1987. Three days out of high school Scott Robinson was long-lining for halibut in the Bering Sea. In interviewing for his first insurance position, his fishing heavy resume landed him the position of the lone maritime adjuster for Transamerica Insurance. In the years that followed, Mr. Robinson gained a variety of skills in the insurance industry with an emphasis on maritime claims. Prior to leaving Royal & SunAlliance he was the West Coast Claims Manager. For the last 14 years Mr. Robinson has attended monthly educational seminars put on by the Puget Sound Maritime Claims Association as well as educational forums put on by The Marine Association of Seattle. He is a past board member and President of the PSMCA. Mr. Robinson has been a moderator for the NAMS seminar in San Diego and facilitated a seminar for GAB for their "Wet Marine" school. 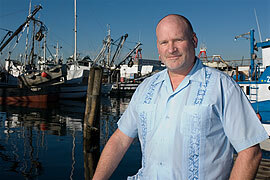 Today Mr. Robinson holds memberships in various associations and is an active member of the maritime community.